How does Time2Track work for Organizations? How is a Subscription Provided for a Trainee? How does an Authorization Key Work? Time2Track is a web-based software solution for tracking and managing clinical training experiences. 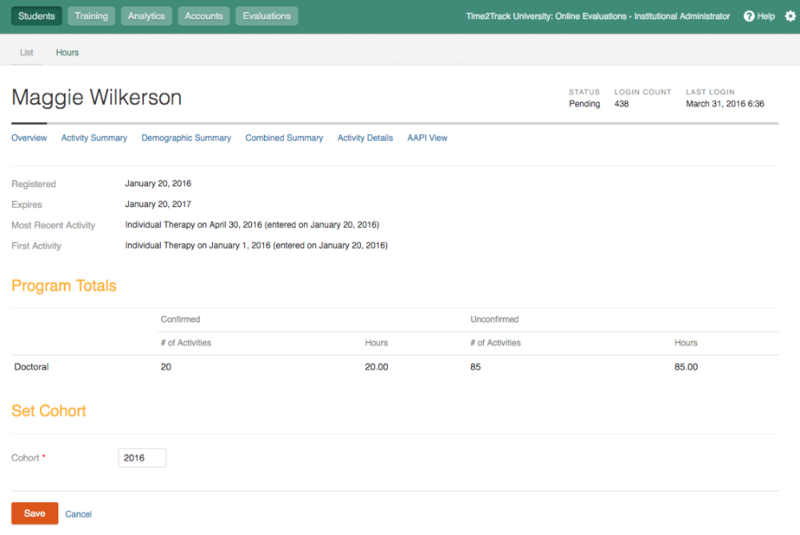 Individuals (Students, Interns, Postgraduates, and Professionals) use Time2Track to track their clinical training experiences, client demographics, and assessments administered. Individuals can then submit those experiences to their Supervisors for approval – electronically through Time2Track or by using printed reports. Organizations, Graduate Programs, and Training Sites can monitor their trainees’ progress, track online approvals, and generate aggregate training reports. Organizations who decide to use Time2Track with their trainees will have an institutional account set up for their program. Along with the set-up of the institutional account, an administrator account will be added for the person who will be managing the institutional account. This role is usually designed for program administrators, lead faculty, or others who will play a significant role in managing Time2Track. Through the institutional account, the administrator will have the ability to track the data their trainees are logging and monitor allocated subscriptions. In addition to these features, Time2Track also gives organizations the ability to have trainee hours approved online and send evaluations online. When an Organization has the Online Approvals and Forms features, which are included in Time2Track's premium plan, the administrator will work through the institutional account to set-up and edit online approval information (training sites, supervisors, courses, etc. ); build, distribute, and sign forms and evaluations; run analytics. 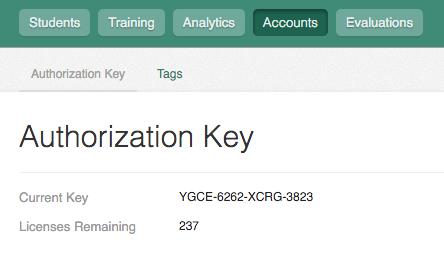 An Organization purchases Time2Track subscriptions for their trainees, who then use a special authorization key to either sign up for a Time2Track account or add a subscription to an existing account. If an Organization requires their trainees to purchase a subscription directly from Time2Track, instead of providing a subscription for them, instructions will be sent to the institutional administrator to be shared with trainees. These instructions will have steps for the trainee to either sign up for a new account that will be connected to the program's institutional account or to connect an existing account to their program's institutional account. When your program becomes a Time2Track client, a special authorization key is created with the number of purchased subscriptions loaded on it. Then, specific instructions will be sent to the institutional administrator to share with trainees who need to either sign up for a new Time2Track account and/or for trainees with an existing account who need to renew the subscription on their accounts. When the authorization key is used by a trainee to create a new account, it will link the trainee's account to the organization's institutional account, allowing the administrator to monitor the trainee's progress. When the trainee's account is set-up, a subscription is added to the account through the program's authorization key that was used. NOTE: A Time2Track subscription is good for one year for each trainee. Each year, your Time2Track account manager will contact you to renew your subscriptions. At that time you'll purchase subscriptions for the upcoming year to cover new incoming trainees as well as existing trainees who need to renew their subscriptions. Time2Track subscriptions that not been used do not expire and will roll over to the next authorization key at the time of renewal. Time2Track can be used by many programs "as-is", but we also offer many ways to customize Time2Track to fit your program's needs. The features below are optional and may or may not be included with your program's Time2Track subscription. Please contact us for more details. Time2Track has several “default” activity type and treatment setting lists already available. 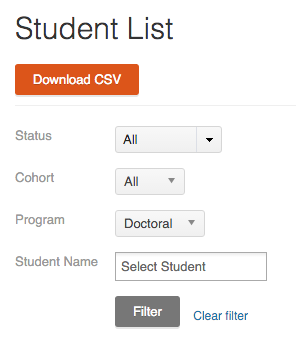 If the default lists do not fit your program’s needs, we can work with you to create custom lists. This will need to be done before your trainees start using Time2Track, so talk to your Time2Track Representative or contact us to decide which option is right for your program. Online Approval can be implemented at any time for your program and is the electronic alternative to having supervisors sign printed paper reports. The setup process is very easy, and moving to Online Approvals can save your program a significant amount of time and paper. Time2Track also tracks changes to activities that go through the approval process, so you can be confident that your data is accurate and reliable. Some training programs need to track additional demographic information for clients served by their trainees. This information can be crucial for grant applications as well as program development. Time2Track allows you to create customized tags for your trainees to use when tracking clients in Time2Track. Time2Track Online Evaluations allows you to send your program's evaluation forms to supervisor and trainees directly through Time2Track. The forms are completed electronically and are available to you instantly once completed. Data from the forms can be downloaded into a spreadsheet for analysis. When customizing Time2Track, many programs find that it is helpful to have a "Demo" trainee account. This is a free individual Time2Track account that allows you to see what your trainees see when using Time2Track. 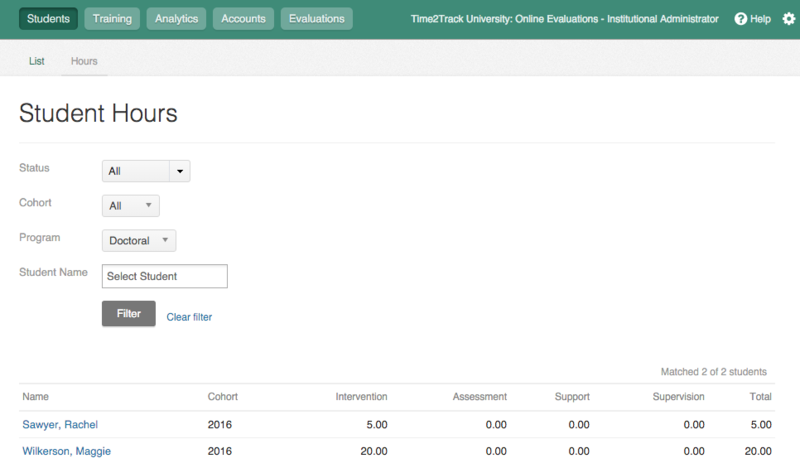 Your Time2Track Institutional account allows you to view and monitor your organization's trainees who have signed up for Time2Track. You can use Time2Track to view individual trainee progress reports as well as aggregate reports. 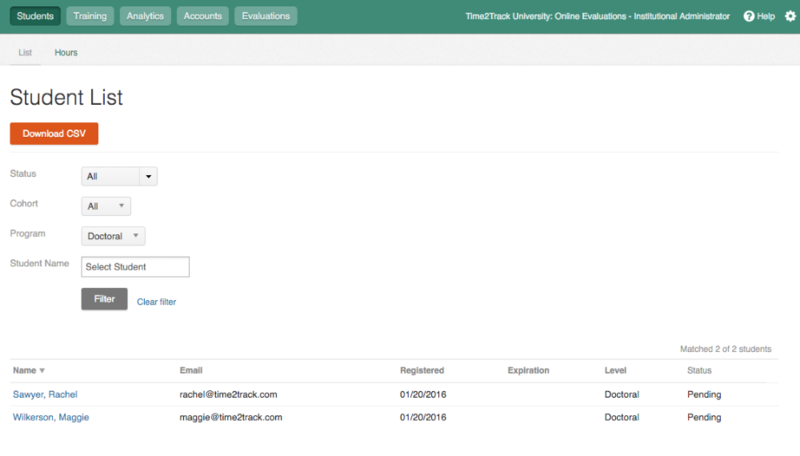 Click Students then List to view a list of your trainees who are signed up for Time2Track. An individual's Status refers to the status of their Time2Track account. Pending means they have signed up for a free trial of Time2Track, but have not activated their account with a credit card or authorization key. Active means they have activated their account with a credit card or authorization key and Expired means their Time2Track account has expired. Click a trainee's name to view their account details, change their cohort, or view individual progress reports for that person. 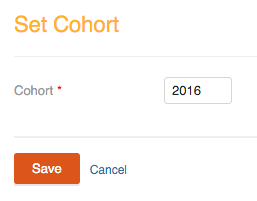 To change a trainee's cohort, type the correct year in the Cohort box, then click Save. Click Students then Hours to view overall hour totals for all your trainees. If your Program filter is set to All, you'll see a grand hour total for each trainee. If you select a Program (eg. Doctoral), you'll see a grand hour total plus category totals for each individual. Click Analytics to access a list of aggregate reports of your program's training data. The reports listed below may differ from the reports available in your Time2Track account. contact us to discuss any custom reporting needs your program may have. Click on the name of a report to run the report. Depending on which report you select, you may need to choose some filtering options for the data. For large reports, the file will be emailed to you. Click the Accounts tab to view your program's current authorization key and the number of unused licenses you have remaining. To purchase additional licenses, reach out to your Time2Track representative or contact us.